I always treat myself to an assortment of fall-flavored coffees for my Keurig. It's so fun to enjoy all the tastes of the season and they smell divine! It's also a great way to sample lots of flavors and find some new favorites. I've mentioned these before, but I seriously wear one of these every day in the cooler months. Here in Colorado, the mornings and evenings are cool even on warmer days, so these lovely cardigans keep me happy! 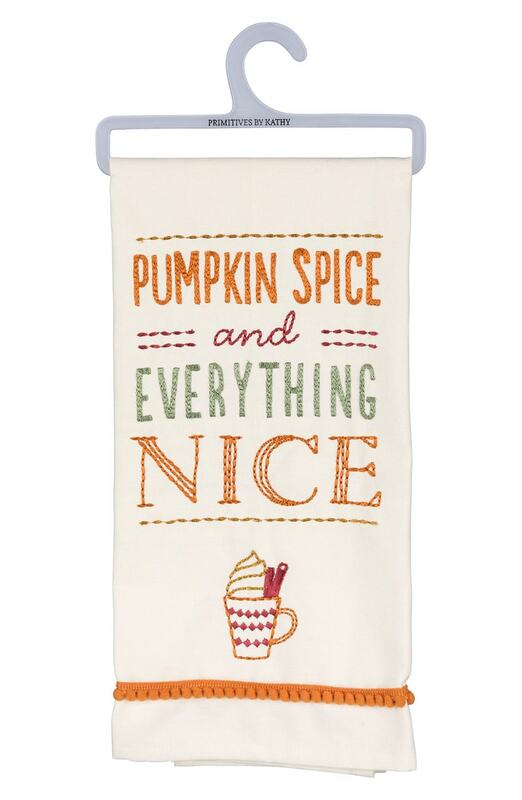 You know I love a fun tea towel and this one is just perfect to cozy up your kitchen. Note: We have an advertising relationship with some of the stores we link to in this post. We only work with brands we love and trust. This time of year we watch all the Charlie Brown cartoons. They are sweet, safe and short. (Can I get an amen that sometimes you want the kid movie to be short?) Plus there's one for every holiday... like Thanksgiving! I found these darling turkey napkins at Swoozies, put them on my mustard yellow plates and called it a day. They are super cute! The foil just makes it. Don't be jealous of my amazing chalk art skills. Ha. I love my pumpkin-shaped chalk board from Chalk Ink. I have a Texas one too! For dinner, I wanted something easy at the end of a long week. I mentioned picking up Honeybaked Ham and my husband and son got super excited. So there ya go. I picked up some ham and two of their super-easy heat-and-serve sides. Done. It's a treat for us, but so hassle-free at the same time. Plus, it's the kind of meal you tend to enjoy during the holidays. I hope your Thanksgiving week is also hassle-free, full of good food and lots of time with people you love. I'm thankful for each of you who read here!